Two rail-link services that started under the tenure of GNER are to be cancelled by the end of August. 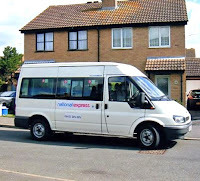 The first, Stagecoach-operated Hampton Taxibus, was withdrawn on 25 July after GNER's successor, National Express East Coast, failed to reach agreement on terms for an extension to the contract, which also saw financial support from Peterborough City Council. A recent decrease in journeys linking Lincoln city centre, North Hykeham and Witham St Hughs with Newark Northgate was a pre-cursor to this service's demise by the end of this month. 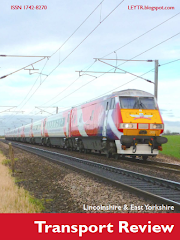 Promised in their franchise manifesto back in 1996, GNER said it would commence coach links between Newark-Lincoln, though any meaningful service didn't commence until 2005 when Dunn-Line's Lincoln depot was awarded the then number 225 service. This operated half-hourly in the morning peak from Lincoln to Newark and to a similar frequency in the evening peak. With many RoadCar contracts in Nottinghamshire being lost to Veolia in 2006, an increase in the now-number 46X service saw a steady frequency throughout the day and when added to the new Service 46 operated by Stagecoach, which omitted Newark Northgate station but travelled into the town centre instead, an impressive bus frequency was seen between Lincoln-Newark which incidentally sees around 2 trains per hour, too. Many of these now-numbered 46X journeys in the early morning/late evening peaks were used as positioning runs for Veolia services garaged in Lincoln yet operating the whole day in Notts. Rather than operate dead, subsidy was paid for a virtually identical journey - nice work if you can get it! It seems, though, that where GNER promised a lot more than it could deliver in order to retain its contract when re-tendering took place in 2002 - a move which played some part in its downfall - incumbent franchisee National Express East Coast is keen not to make the same mistakes by following in its predecessor's footsteps and so is choosing not to continue such rail links when each comes to the end of their tender period. 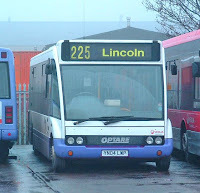 Neither the 225/46X service nor the Hampton Taxibus made a profit, the 225 was included in GNER's 1996 franchise manifesto to bring Lincoln that little bit closer to London - something NXEC are physically hoping to accomplish with proposed direct rail services starting as early as next year - and the Hampton suburb of Peterborough was (and still is) being built from scratch and has been given the name "the Environmental city" with a huge emphasis on the ecology and sustainability, so a semi-flexible, demand-responsive Taxibus to take a load of cars off the road seemed a good PR move by GNER. In the mean time both Lincoln and Peterborough offer 'PlusBus' schemes offering day tickets at better value than can be bought by non-rail passengers; meanwhile those living in the Newark/Kesteven area, plus sections of the soon-to-be erstwhile 46X route have Lincolnshire County Council's latest CallConnect initiative: Service 1K 'Kesteven CallConnect'.